New Delhi, May 12, 2017: In a clear success of its strategy for digitizing entertainment, UC News, a content and news distribution platform that is part of Alibaba Mobile Business Group, garnered an average daily views of 6.6 million on the UC News app for its innovative IPL campaign “Match ki Kahaani, Celebs ki Zubaani” with #MasalaCommentary. 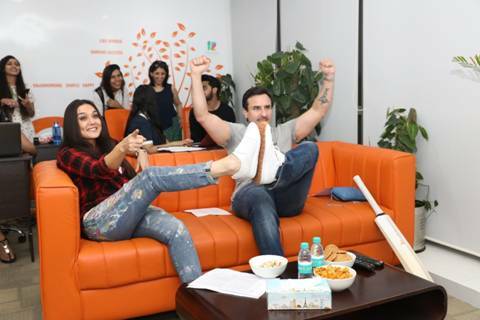 UC News ran a first-of-its-kind campaign, bringing together Saif Ali Khan, Preity Zinta, Sunny Leone, Virender Sehwag, Sunil Grover, Rakhi Sawant and Kamal R Khan to give commentary in their witty and inimitable style on the ongoing IPL matches. UC News also got the celebrity commentators to take interesting cricket-based challenges. The chat and activities were live streamed on the UC News app. The videos have clocked another 75 million views on the UC News’ YouTube channel, UC Talks. “Total time spent consuming content on the mobile has seen a sharp rise among Indian audiences with sports, especially cricket, being one of the most popular content category for UC News readers. Not just that, multiple new-age digital media platforms are challenging the traditional mediums. The success of our app-only videos with celebrities is a clear testament to that”, said Young Li, Head of UC News. On April 5, Saif Ali Khan and Preity Zinta revived their popular on-screen pairing after 12 years to live comment on the opening ceremony of IPL followed by the match between Royal Challengers Bangalore and Hyderabad Sunrisers. Comedian Sunil Grover donned his famous on-screen persona of Dr. Mashoor Gulati and partnered with actress Sunny Leone to comment on the match between Kolkata Knight Riders (KKR) and Kings XI Punjab (KXIP), causing a laugh riot. After losing the challenge, Sunny Leone also danced to the tunes of a Punjabi number with Sunil on the occasion of Baisakhi. Former cricketer Virendra Sehwag and Bollywood actress Sunny Leone teamed up for a fun-filled session during the Delhi Daredevils, Sunrisers Hyderabad match, causing a major buzz on social media. UCWeb Inc. (UCWeb), a business within Alibaba Mobile Business Group, is a leading provider of mobile internet software and services. Since the inception in 2004, UCWeb's mission has been to provide better mobile internet experience to people around the world. The international product portfolio of UCWeb includes UC Browser (mobile browsing service), UC News (content distributor), 9Apps (Android app store), and UC Union (mobile traffic and monetization platform). UC Browser is one of the world’s top 3 mobile browsers (as per StatCounter). UC Browser has reached 420 million Monthly Active Users as of August 2016, while 9Apps has clocked over 250 million. Additional information about UCWeb and its products can be found at www.ucweb.com. UC News is a big-data powered content distributor, serving as a one-stop source of trending and curated news content covering all popular categories that Indian users can consume on the go, with 20+ featured channels including news, cricket, technology, entertainment, movies, lifestyle, health, humor, etc. UC News integrates trending content from social media and partners with traditional media, self-publishers and key opinion leaders for original content. UC News is now available in 3 languages including Hindi, Indonesian and English. UC News is major product of UCWeb Inc. – a business within Alibaba Mobile Business Group. UCWeb's flagship product UC Browser now integrated with news feeds from UC News, is the No.1 mobile browser in India according to StatCounter.